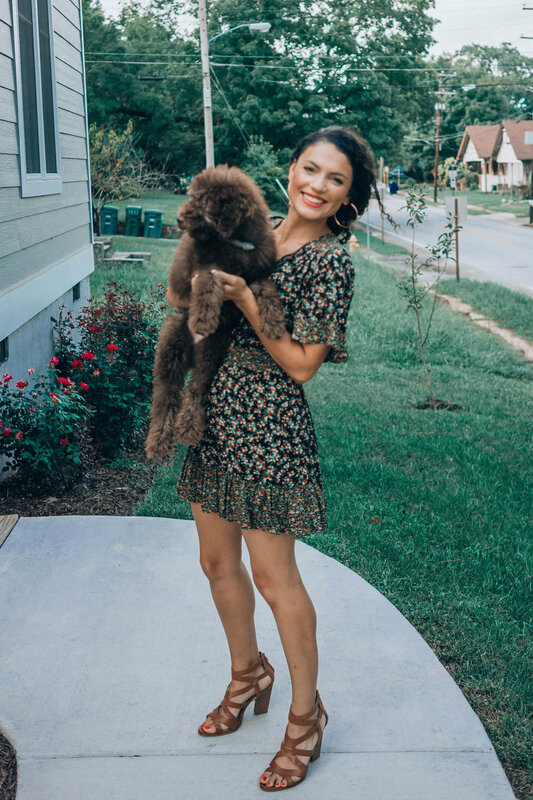 Floral Print Midi Dress + Puppies — monetsommers. Hey there! Long time, no talk. It's crazy how life get's so busy and you put your favorite hobby on the back burner. Between working full-time, raising this fur baby (meet Frank! ), and still settling into our new lives in Chattanooga, life has been busy to say the least. Still no excuse to stop your side hustle and creative outlet. Am I right? I love, love this dress. Love it so much I've worn it a dozen times in 20 days. Yes, I know... it's excessive. But when your job involves seeing different people each day I figured no one is really noticing. Except for my husband who seems to like this dress, so it's a win-win. It's the perfect floral mini dress to transition into fall. I'm thinking brown booties, wool hat, and oversized denim jacket will do the trick.